The CES 2015 mobile app will give you a wealth of information that will come in handy as you walk through the massive event this week. The app provides event headlines, interactive maps, exhibitor & schedule listings and speaker details. App users can create their own schedule by favoriting different sessions and speakers. As for what we can expect this week at CES as Windows Phone fans, it is a good question. Don’t expect to see a flagship phone to replace the Lumia 1520 but there is certainly the possibility we will see a replacement for the Lumia 1320, the 1330, which has been a on going rumor for several months now. It is also possible we will see additional phone manufactures like LG and ASUS announce new Windows Phone devices. 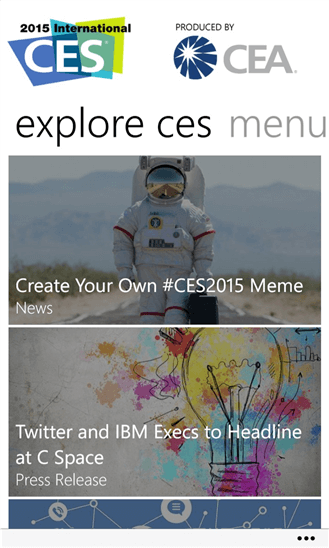 The CES 2015 Mobile app is free and available now in the Windows Phone Store.